Hi there! I'm new to the forum and was hoping someone might be able to help me. 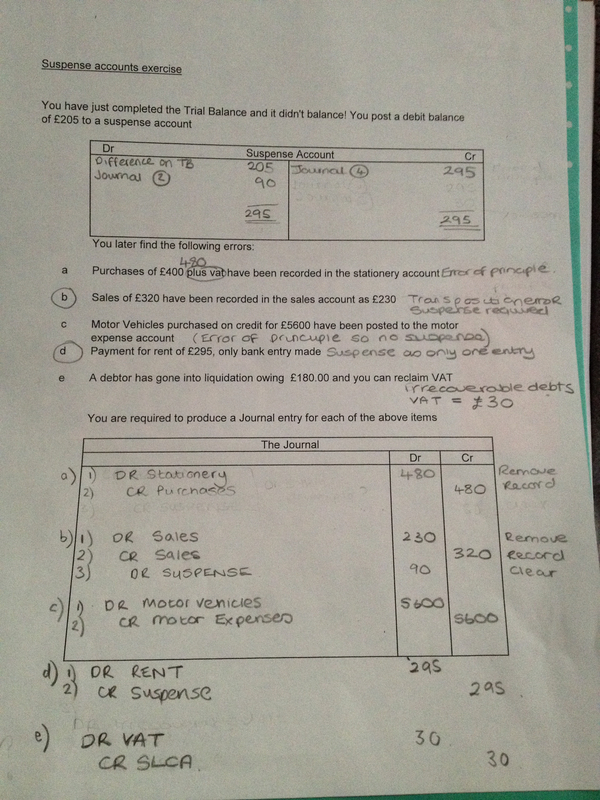 I've got my bookkeeping controls exam in just over a week time and still struggling to get my head around suspense accounts and correcting errors not shown by the trial balance too. I've had a go at a question in the attached pic and I'm completely clueless as to whether I'm correct or not. Just hoping someone kind can have a look and see if I'm on the right track before I venture any further? Many thanks! It is a good attempt, but you have made a few mistakes. a) You have basically repeated the error made in the question. As this removes the incorrect Stationary entry and puts it in the Purchases Account instead. Also this is not an Error of Principle. Because the person making the entry has confused two expense (or Revenue Expenditure) transactions - I.e Purchases and Stationery, this is actually an Error of Commission. Easiest way to remember , Commission has SI in it - meaning Similar. e) You have only done half the job. You haven't recorded the Irrecoverable Debt expense to the business. Cr SLCA 180 (As you have to remove the Customer's balance from the Control Account). Which is based on the Osborne book. I made them for my students. So say the asset purchase was debited to the expense account which sits under equity. If we are in the same section of the accounting equation it is an error of commission. this is great thanks. and the video is really helpful. thank you for your help. its really kind and has helped me get my head around things. just got a weekend planned full of revision now! Hi everyone. Just wanted to let you all know that I sat my exam last night and I passed! so I just want to thank you all for your help. This is the first time I've used the forum and everyone has been so helpful and prompt with my queries! Hopefully one day I'll be able to help other people the way you guys did! Right onto the next module now... elements of costing!